CPR in a diving bell is difficult. It is taught by diving companies and training institutes but has not been subjected to the tenets of evidence based medicine. The diving bell lacks space as well as a flat hard surface to lay the patient on and therefore conventional methods of administering CPR are not possible. The diver is hung from a pulley tied to the diver's harness, and the bell flooded with water to reduce pooling of blood. Airway is established using a cervical collar to hyperextend the neck and inserting an appropriate oropharyngeal airway. Cardiac compressions are administered by the bellman using his head or the knee while holding the patient with his arms from behind. The bell can be recovered to surface only when spontaneous breathing and circulation have started. Diving bell offers a unique environment for management of unconscious casualties. Even though the method is at variance with the conventional method of administering CPR, it is the only method possible inside the bell. It is important that the method be scrutinized and refined so as to be more effective and efficacious inside the bell. Bell diving is a technique used in a variety of scenarios in both commercial as well as military diving. The Diving Bell [Figure 1] is a spherical submersible diving chamber that is connected to the diving support platform/vessel by an umbilical. It can accommodate two divers and is capable of being lowered to a predetermined depth into the sea at which one of the two divers goes out into the water to perform the specified task. At depth, the Diving Bell is maintained and monitored with a system aboard the diving support platform with the help of an 'Umbilical' through which pass breathing gas supplies, hot water for the divers' suit, communication cable and video monitoring cable. Inside, the diving bell contains various equipment to support the diving operation and the divers and therefore, affords very little space for the divers themselves. During the diving operation, one diver moves into the water to perform the task (known as the 'Diver') whereas the other remains inside the bell (known as the 'Bellman') to monitor the diver's life support system. 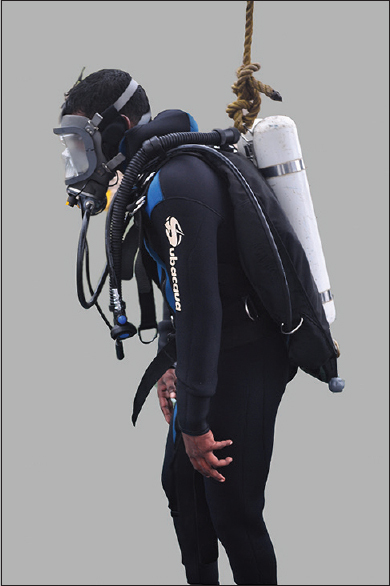 The diver during performance of his task is prone to a multitude of hazards which can quickly result in unconsciousness while inside the water. Airway management and resuscitation in a diving bell are difficult due to the confined space, limited lighting and rudimentary equipment. The bell opens from below and there is no flat dependent surface inside due to its peculiar design. CPR cannot be administered to an unconscious diver in the conventional manner of laying him on a flat hard surface and administering external cardiac compressions. Insertion of an endotracheal tube is difficult and cuffed airways are fraught with problems of maintaining the cuff sealing while compression/decompression. The first task for the bellman when the diver becomes unconscious is to recover him from the water into the bell. The bellman moves into the water, tracks the unconscious diver through his umbilical and gets him back. Once at the bell, he floods the bell with water and uses a pulley system to hoist the diver using a harness attached to the diver., Recovery into a dry bell could lead to pooling of blood leading to worsening of the patient's condition and is therefore not advisable. 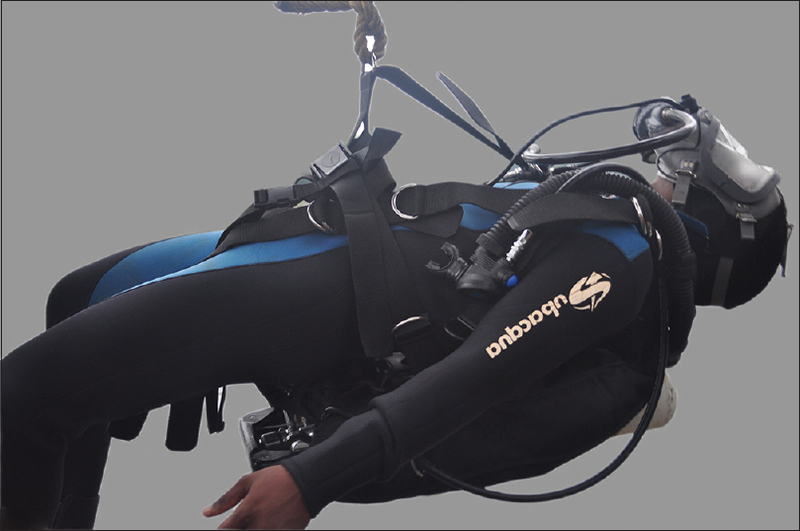 During recovery, position of the diver while being hoisted is also important. Posterior fixation enables easier hoisting but the head flexes on the neck and the airway is compromised [Figure 2]. Placing a cervical collar at this time is time consuming. But anterior fixation of the harness may cause the diver's body to foul on the entry of the bell  [Figure 3] and therefore, posterior fixation remains the only option. It is only when the diver and the bellman are both inside the bell that CPR and management of the diver can take place. Once inside the bell, the bellman will assess the diver's state including airway, breathing and circulation by removing the helmet and checking carotid pulse. To maintain the patient's airway, a semi-rigid cervical collar available inside the bell is used to raise the chin. The collar allows the mouth to drain and tongue to hang out. Once the collar is in place, an appropriate airway is inserted to allow rescue breath.,,, Oropharyngeal airway or a classical laryngeal mask airway can be readily used because of ease of insertion. Guidel's airway or a nasopharyngeal airway can only be used if the patient is unconscious but breathing spontaneously as rescue breath administration is difficult with these airways. Nasopharyngeal airway is the airway of choice if the patient is semi-conscious and intolerant of the airway or if he has trismus. Endotracheal intubation is not possible. With the patient hanging from his harness, the walls of the bell being too far away and that too lined with equipment, the bellman will have to provide both pressure and support to administer external cardiac compression. Two techniques are possible here. One, when the patient is suspended at the bellman level and the other, when the patient is suspended lower. In the former, cardiac massage is given by the bellman embracing the diver from the front under his arms and applying the head against the sternum, at the same time pulling the patient against his head rhythmically [Figure 4]. In the latter case of diver-patient being suspended lower, the bellman will have to hold the patient's harness at the shoulder level from the front and apply the knee against the sternum continuously pulling the patient against the knee rhythmically [Figure 5]. During CPR, the bell cannot be recovered to the surface as this will entail removal of water from the bell. Removing the water from the bell would lead to pooling of blood and hence cannot be done until spontaneous breathing and cardiac activity have returned. On surface, the diver may be transferred to the deck decompression chamber but decompression cannot be carried out till the patient recovers consciousness because of the danger of pulmonary barotrauma and arterial gas embolism. The method of CPR described here has significant deviations from the conventionally practiced method of CPR. But this method has been taught by diving companies and dive training institutes and has been in practice since a very long time. Myers and Bradley had way back in 1981 evaluated this technique and compared it for efficacy with conventional methods of administering CPR. They concluded that the method of applying 'Knee to the Chest' was the closest in efficacy to the conventional method of cardiac massage with the patient supine but this method could not be sustained more than 10 minutes due to resuscitator fatigue. The other method of applying 'Head to Chest' failed to achieve adequate compression pressure and could be sustained only for 3 minutes or less. Diving bell offers a unique and unparalleled environment for management of unconscious casualties which are very likely considering the risks involved in diving. Because of lack of space and hard flat surface, administering CPR inside the bell cannot follow conventional methods. The method outlined above might not be very efficient but is practical and probably the only way to deliver CPR and is frequently taught in diving training establishments. It is imperative that the method be subjected to greater scrutiny to determine its efficacy and refined appropriately so as to be effective inside the diving bell. Acott CJ. The use of extraglottic airway devices in diving medicine - A review of the literature. Part 2: Airway management in a diving bell and deck decompression chamber. Diving Hyperb Med 2007;37:16-24. 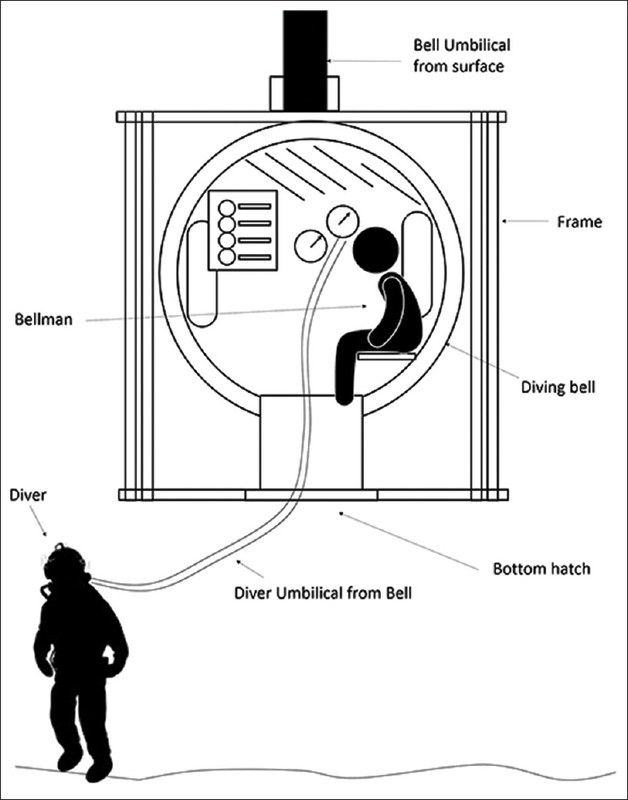 Handling of an Unconscious Diver in a Diving Bell. Safety and regulations Booklet. INPP Diving Supervisor's Manual. Marseille: Institute National De Plongee Professionelle; 1990. p. 28-54. Henderson P. Management of diving accidents. SPUMS Journal 1995;25:36. Gorman D. Management of diving accidents. SPUMS Journal 1994;24:148-57. Myers RA, Bradley ME. An evaluation of cardiopulmonary resuscitation techniques for use in a diving bell. In: Bachrach AJ, Matzen MM, editors. Underwater Physiology VII. Proceedings of the 7th Symposium on Underwater Physiology. Maryland: Undersea and Hyperbaric Medical Society; 1981. p. 887-99.